More than any material gift, travel means so much to me and Chris. After our wedding, we both really wanted to take the time to truly soak up that special, fleeting time. My husband had recently finished medical school, so we had the time to go on a longer trip, and he had never been to Europe. We wanted some history, but also wanted beaches, views, water, and relaxation. We wanted to go somewhere where we could safely explore and be outside, but also sit by the pool and completely relax if we felt like it (read: the perfect honeymoon). 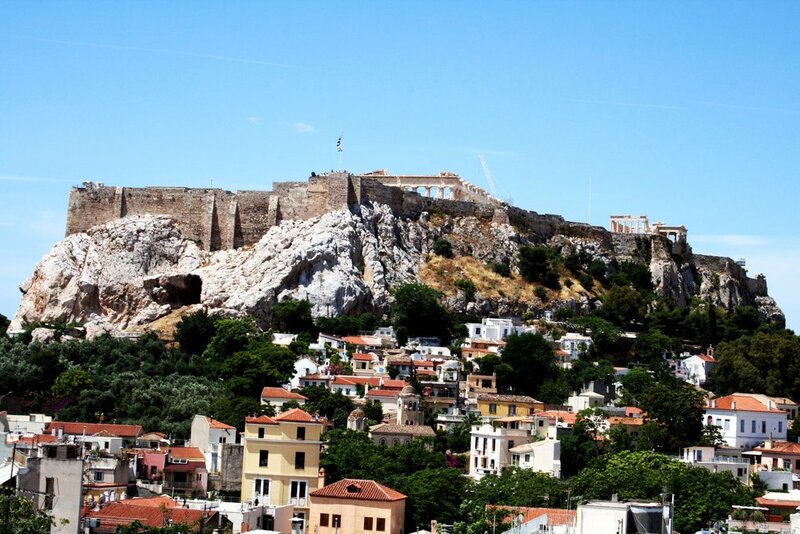 In Athens, we stayed at the Hotel Electra Palace in the Plaka district. For only being in Athens for one night, this was perfect. We landed at 11 AM and after a quick shower, went straight to lunch followed by the Acropolis. 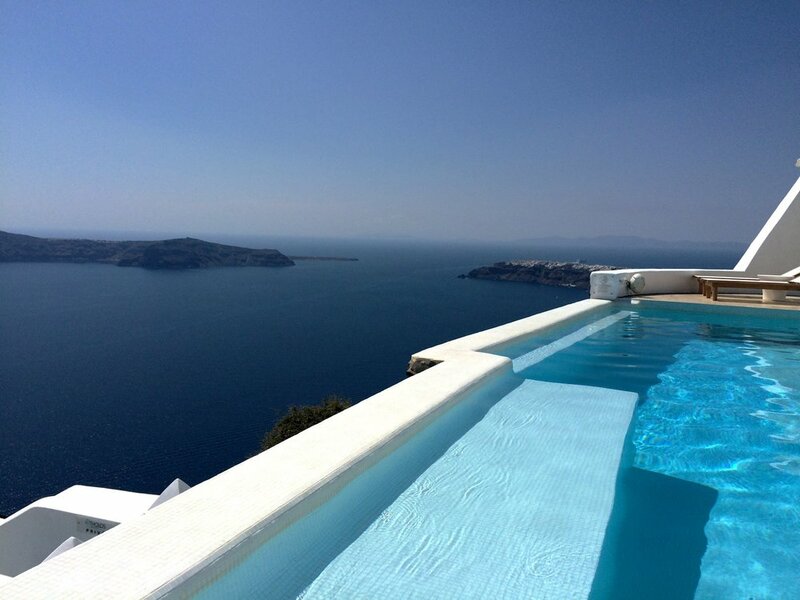 After some sightseeing, we relaxed at our hotel pool, which overlooked the Acropolis and generally had gorgeous views. After that, we had dinner and got some rest after a long day of travel. For dinner away from the crowds in Mykonos Town, visit To Maererio. We found this restaurant, and the other recommendations from Mykonos, from 36 hours on Mykonos and the suggestions did not disappoint. To Maererio is tucked away in Mykonos town off the busier footpaths. We drank the house wine, sauted garlic and mushrooms, pork stew, and shrimp. Near Agios Sostis Beach, on the north side of the island, there is not only a gorgeous beach but a rustic tavern called Kiki’s. Kiki’s is cash only, serves fresh salads and barbeque. Kiki's was by far one of our favorite memories from our trip. Rent an ATV or car, and bring water/beer/snacks if you want to hang at the beach nearyby before or after. The beach nearby is stunning, and much quieter than the beaches on the southern side of the island. Be warned, Kiki’s is only open for lunch, and can have an hour or more wait. Nammos is a famous restaurant / club on the bay of Psarou on Mykonos. We went here only for a drink, as reservations are entirely necessary and we couldn’t be seated. Be advised, this is a see and be seen type of place, which we weren’t ready for. Still, the atmosphere and beach are beautiful, and worth a stop for a drink. We ended up eating fresh prawns down the beach, but if you’re up for a super swanky lunch and want to feel like you’re famous, make a reservation at Nammos and enjoy watching the world’s elite come in off their yachts. Tsigrado beach requires a bit of a descent, as it is only accessible by climbing down a ladder. It is a small, gorgeous beach on the south side of the island. After spending time at Tsigrado, we climbed back up and walked down to Firiplaka beach. Bring a picnic lunch or snacks if you think you might be hungry. Drive to the southern portion of the island and visit Paleochori beach. There are a couple restaurants right on the sea that serve, naturally, seafood. Enjoy lunch and some time at the beach, and then make your way around the coast to check out the abandoned sulfur mines. Be warned, don’t take your car to far into them. In Pollonia, there are a few adorable places to eat (have your hotel make a reservation, since these places are small and only have a few tables). We ate at Armenaki Fish Tavern where we had a bottle of rose, lobster spaghetti, and fish carpaccio for 45 euro. The next night in Santorini, we discovered this was quite a steal, as the same meal there is over 100 euro. Our hotel was in Imerovigli. We first hiked up Scaros, which took about one hour, and gives you an amazing view both of the caldera and the island behind you. Then, we continued on our way to Oia. The hike took about 2 to 2.5 hours from Imerovigli to Oia. 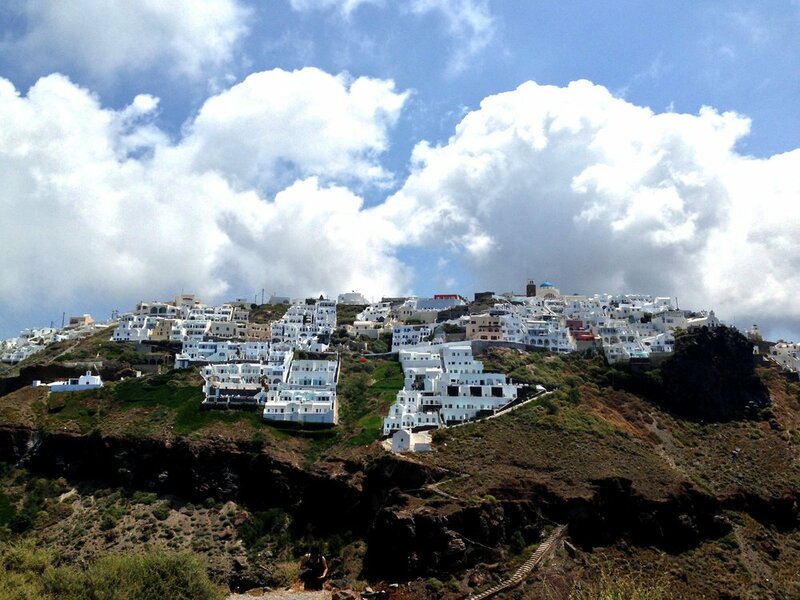 We loved this, the views are stunning and at the end, we had lunch in Oia. For dinner, we enjoyed Il Cantuccio. The food was well priced, delicious, and it lacked the touristy vibe we got in so many other restaurants in Fira. We drank house wine and ordered a couple of dishes, and it was a nice break from Greek food (though I could eat Greek everyday for ever). To make this trip happen, we did two things. First, we worked with a travel agent (contact me if you need a referral!). Our travel agent came to us highly recommended by a family friend, and we were so thrilled with the end result. The price was less expensive than other travel companies we asked for quotes from, and the service in Greece (transfers, hotels, etc.) was excellent. We also planned pretty far in advance, over 6 months out, which I recommend if you plan to go during the summer. Saving for a trip like this is no joke. We saved our money, and also set up a honeymoon registry to help us make this trip a reality. We used Honeyfund. We used their setup tool to create specific gifts, rather than asking for undetermined gifts. For example, instead of "funds for Santorini" which feels impersonal and kind of rude, we'd create a gift for "Sailing on Santorini on the Dreamcatcher" so that our friends and family who chose to give us our honeymoon registry knew their gift was going to something that meant a lot to us. We then were sure to thank people in our notes very specifically for these experiences. Avoiding tourist traps: You’ll be able to spot a touristy place by the big menus and haggling hosts out front, and by expensive prices. Avoid this scenario. Choosing which islands to visit: Definitely, definitely, visit another island besides Mykonos and Santorini. 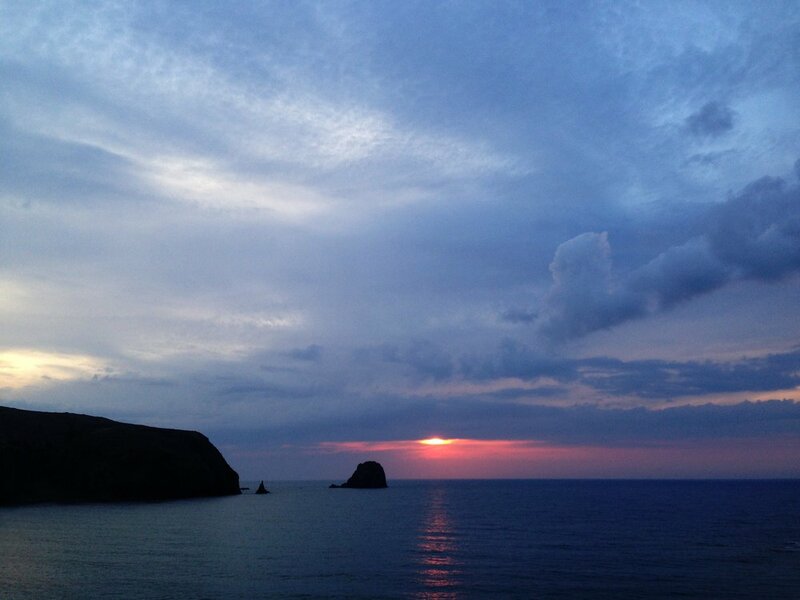 Make an effort to go to an island that is a little off the beaten path. We enjoyed Milos the most. It was the least touristy in our opinion, and wasn't overrun with other honeymooners. If we go back to Greece, we'd go back to Milos, or other islands like Paros, Folegandros, Sifnos, etc. Concierge: Take advantage of your concierge at your hotel. Ask them to help you make dinner reservations, and make an effort to leave your hotel pool. I found the concierge staff at our hotels more helpful than any I've recently experience in the US. Motion sickness: Be advised that if you get sea sick, ferrying between the islands may be difficult for you. Flying is a little bit more expensive, but will likely save you the hassle of the ferries, which are notoriously unreliable. We were happy we did the ferries, but one day when we go back, I'd choose to fly between the islands.